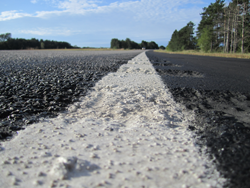 This research effort provided the Minnesota Department of Transportation (MnDOT) with field data on the performance of pavement marking materials when used as rumble stripes on MnDOT roadways. These field efforts provide a perspective on the impact that both wear and winter maintenance practices have on retroreflectivity. Given that these markings were installed by a variety of MnDOT contractors and at different times and roadways, this report also serves to document the range of retroreflectivity provided to drivers at any given time on similar two-lane MnDOT roadways under the installation practice guidelines at the time of installation (2012 to 2013). More specifically, these measurements consider the difference in retroreflectivity provided by direction of travel (e.g., for the same marking, what is the retroreflectivity while driving northbound versus southbound?) and by roadway. The long-term evaluation collected field measurements both initially and after two winters (18 months) for centerline rumble stripes only and on seven segments over three different roadways. 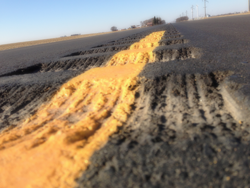 The in-service evaluation included new centerline and profile rumble stripes, all of which were installed as part of the 2013 mill and overlay projects on bituminous surfaces and included adding new rumbles and rumble stripes within District 4 on two-lane MnDOT roadways. The retroreflectivity data were collected one winter (approximately 12 months) after installation with no initial measurement data being available. This effort included measuring the centerline rumble stripe performance over eight segments on four different roadways and the profile rumble stripe performance over 18 segments on 10 different roadways. · The amount of retroreflectivity provided by direction of travel for the same centerline marking varied considerably. This variation is a result of rumble stripE installation practices and, more specifically, bead distribution and embedment. · A comparison of retroreflectivity after 18 months showed considerable variation among the three roadways measured. The in-service evaluation included new centerline and profile rumble stripes, all of which were installed as part of the 2013 mill and overlay projects on bituminous surfacesand included adding new rumbles and rumble stripes, within District 4, on two-lane MnDOT roadways. · The amount of retroreflectivity provided by direction of travel for the same centerline marking varied considerably for both the centerline and the profile marking. It is especially critical for the centerline marking to be consistent in providing similar retroreflectivity regardless of the direction traveled. · Retroreflectivity, 12 months after installation, was found to vary considerably between the different roadways measured for both yellow centerline markings and white profile markings. · Overall, after one season of service, nine of the 14 roadways had more than 90 percent of their retroreflectivity readings measuring in excess of the arbitrary benchmark that was set for performance.